A 50-foot-long carnivore who hunted its prey in rivers 97 million years ago, the spinosaurus is a "dragon from deep time." Paleontologist Nizar Ibrahim and his crew found new fossils, hidden in cliffs of the Moroccan Sahara desert, that are helping us learn more about the first swimming dinosaur — who might also be the largest carnivorous dinosaur of all. 0:11 These dragons from deep time are incredible creatures. They're bizzarre, they're beautiful, and there's very little we know about them. 0:22 These thoughts were going through my head when I looked at the pages of my first dinosaur book. I was about five years old at the time, and I decided there and then that I would become a paleontologist.Paleontology allowed me to combine my love for animals with my desire to travel to far-flung corners of the world. 0:44 And now, a few years later, I've led several expeditions to the ultimate far-flung corner on this planet, the Sahara. I've worked in the Sahara because I've been on a quest to uncover new remains of a bizarre, giant predatory dinosaur called Spinosaurus. 1:05 A few bones of this animal have been found in the deserts of Egypt and were described about 100 years ago by a German paleontologist. Unfortunately, all his Spinosaurus bones were destroyed in World War II. So all we're left with are just a few drawings and notes. 1:24 From these drawings, we know that this creature, which lived about 100 million years ago, was very big,it had tall spines on its back, forming a magnificent sail, and it had long, slender jaws, a bit like a crocodile, with conical teeth, that may have been used to catch slippery prey, like fish. But that was pretty much all we knew about this animal for the next 100 years. 1:57 My fieldwork took me to the border region between Morocco and Algeria, a place called the Kem Kem.It's a difficult place to work in. You have to deal with sandstorms and snakes and scorpions, and it's very difficult to find good fossils there. But our hard work paid off. We discovered many incredible specimens.There's the largest dinosaur bone that had ever been found in this part of the Sahara. We found remains of giant predatory dinosaurs, medium-sized predatory dinosaurs, and seven or eight different kinds of crocodile-like hunters. 2:36 These fossils were deposited in a river system. 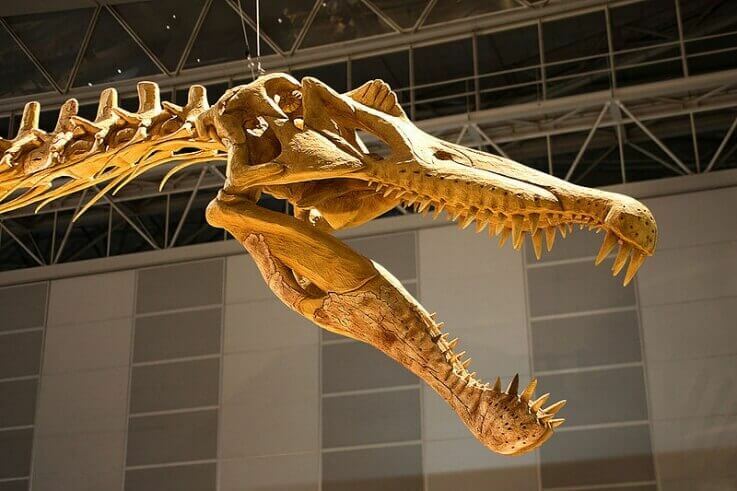 The river system was also home to a giant, car-sized coelacanth, a monster sawfish, and the skies over the river system were filled with pterosaurs, flying reptiles. It was a pretty dangerous place, not the kind of place where you'd want to travel to if you had a time machine. 2:59 So we're finding all these incredible fossils of animals that lived alongside Spinosaurus, but Spinosaurus itself proved to be very elusive. We were just finding bits and pieces and I was hoping that we'd find a partial skeleton at some point. 3:14 Finally, very recently, we were able to track down a dig site where a local fossil hunter found several bones of Spinosaurus. We returned to the site, we collected more bones. And so after 100 years we finally had another partial skeleton of this bizarre creature. And we were able to reconstruct it. 3:35 We now know that Spinosaurus had a head a little bit like a crocodile, very different from other predatory dinosaurs, very different from the T. rex. But the really interesting information came from the rest of the skeleton. We had long spines, the spines forming the big sail. We had leg bones, we had skull bones, we had paddle-shaped feet, wide feet -- again, very unusual, no other dinosaur has feet like this -- and we think they may have been used to walk on soft sediment, or maybe for paddling in the water. We also looked at the fine microstructure of the bone, the inside structure of Spinosaurus bones, and it turns out that they're very dense and compact. Again, this is something we see in animals that spend a lot of time in the water, it's useful for buoyancy control in the water. 4:22 We C.T.-scanned all of our bones and built a digital Spinosaurus skeleton. And when we looked at the digital skeleton, we realized that yes, this was a dinosaur unlike any other. It's bigger than a T. rex, and yes, the head has "fish-eating" written all over it, but really the entire skeleton has "water-loving" written all over it -- dense bone, paddle-like feet, and the hind limbs are reduced in size, and again, this is something we see in animals that spend a substantial amount of time in the water. 4:53 So, as we fleshed out our Spinosaurus -- I'm looking at muscle attachments and wrapping our dinosaur in skin -- we realize that we're dealing with a river monster, a predatory dinosaur, bigger than T. rex, the ruler of this ancient river of giants, feeding on the many aquatic animals I showed you earlier on. 5:13 So that's really what makes this an incredible discovery. It's a dinosaur like no other. And some people told me, "Wow, this is a once-in-a-lifetime discovery. There are not many things left to discover in the world." Well, I think nothing could be further from the truth. I think the Sahara's still full of treasures, and when people tell me there are no places left to explore, I like to quote a famous dinosaur hunter, Roy Chapman Andrews, and he said, "Always, there has been an adventure just around the corner -- and the world is still full of corners." That was true many decades ago when Roy Chapman Andrews wrote these lines. And it is still true today.